It is important not to rely upon just one of the following checks to age Woodcock as differences may not be altogether clear and confirmation using the other checks is advised. In general adult birds tend to have clearer markings with stronger tonal variation between barring and the background colour. Shows wear on the tips of the outer four primaries. This is because juveniles have not yet moulted the feathers with which they fledged have been abraded whilst learning to fly. Shows very little wear on the tips of the outer four primaries. This is due to wintering adults having recently moulted, thus displaying new feathers. Later in the winter some wear can be observed. The tips of the inner three primary feathers in juveniles have a rounded profile. 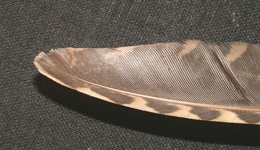 The tips of the inner three primary feathers in adults have a flat profile with a slight notched appearance between the inner and outer webs of the feather. 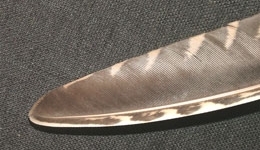 The tips of the primary coverts on the wing on a juvenile have a rounded profile and is the same tone as the rest of the red in the feather. The tips of the primary coverts on the wing of an adult have a flattened profile with a pale tip. The profile of the alula tip on a juvenile wing is rounded. The profile of the alula tip on an adult wing is pointed. The tips of the underwing coverts on a juvenile have a pointed profile. The tips of the underwing coverts on an adult have a flattened profile. It is possible to see a mixture of adult and juvenile underwing coverts as juveniles mature into adulthood.